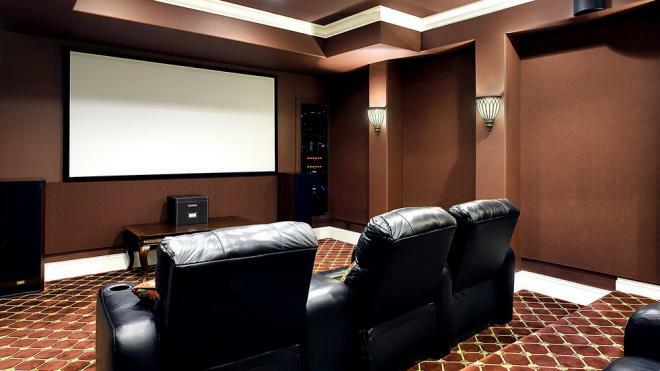 There are so many options, ranging from those who simply DIY paint a wall white... to those who have a professional install custom, acoustically transparent screens with motorized matting to account for varying aspect ratios. You can spend $50 or you can spend thousands. Today, I'd like to tell you about Silver Ticket Products, a company many of you, I'm sure, already know, but whom I stumbled upon earlier this spring while reviewing the excellent Epson 6040UB 4K Enhancement 3LCD Projector with HDR. 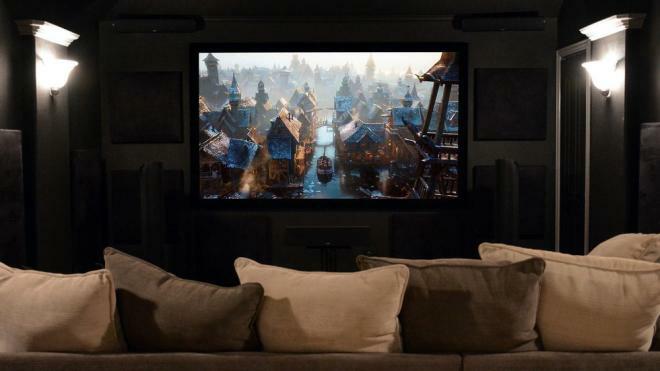 Silver Ticket is a "home theater enthusiast company" that's been in business since the mid-80s, specializing in gear like portable and fixed projector screens, mounts, speakers, and other a/v accessories. While we haven't heard their speakers yet, Silver Ticket screens cost only a few hundred dollars and compete with high-end screen brands costing six-to-ten-times more. Seriously, peruse some reviews on Amazon or online, and you'll find a lot of happy customers. I was so intrigued by my research that I reached out to Silver Ticket directly and they kindly loaned me a 16:9 100" STR-169100-HC 4K Ultra HD Ready Cinema Format Projector Screen where HC stands for High Contrast (more on this in a moment). Silver Ticket Products sells screens in variety of sizes, materials, and aspect ratios, but they all require at-home assembly and wall mounting. In that sense, we'll call these semi-DIY. In addition to the FIXED projector screens, which we're covering here today, Silver Ticket also makes curved frame screens, outdoor portable screens, and motorized electric ceiling screens. If you're looking for an affordable, high-performance screen for your projector, welcome to the promise land. Before we get into my experience testing out the STR-169100-HC with the Epson 6040UB, let's first break down the different screen materials available from Silver Ticket Products. Matte White (1.1 gain). Silver Ticket's smooth vinyl Matte White material offers a 1.1 gain and will work with Full HD, 4K UHD, and Active 3D projection systems. Compatible with traditional or ultra short throw projectors, this material works best in rooms with no ambient light and darkly painted everything. Matte White is great for movies, sports, and gaming, but, again, if there's any light, darker colors and black levels will wash out on the screen. Matte Grey (1.0 gain). 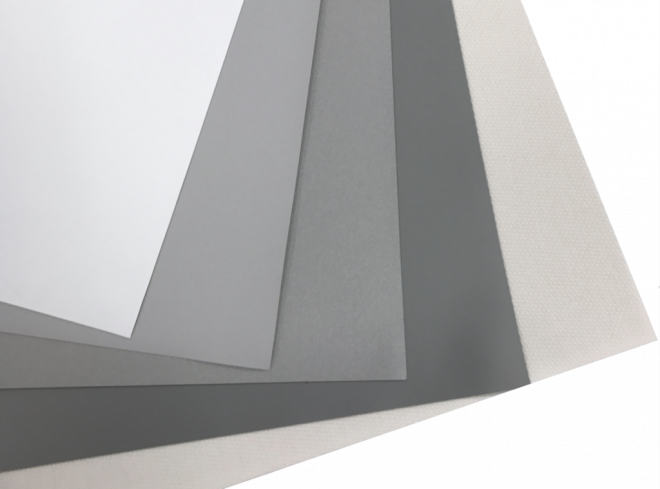 Silver Ticket's smooth vinyl Matte Grey material is a 1.0 gain material and, much like Matte White, works well with traditional and short throw projectors as well as Full HD, 4K UHD, and Active 3D projection systems. 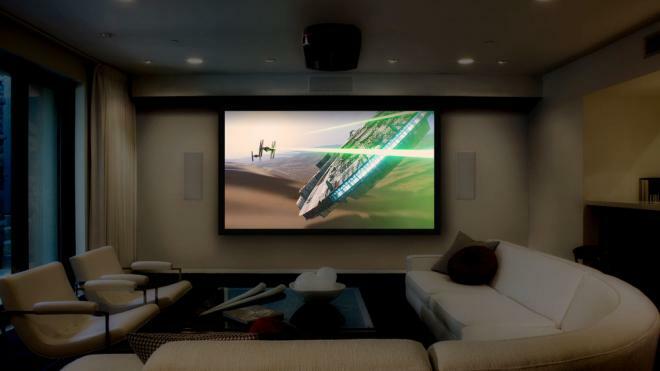 This material can handle some ambient lighting, but works best in a dedicated theater space where you'll be watching movies and playing video games. Silver ALR (1.5 gain). Silver Ticket's vinyl Silver ALR material offers a 1.5 gain and acts very much like High Contrast Grey, but thanks to a "special micro-texture", light coming from the sides of the screen won't bounce back to the audience. As such, this material prevents washout WHILE brightening the image. 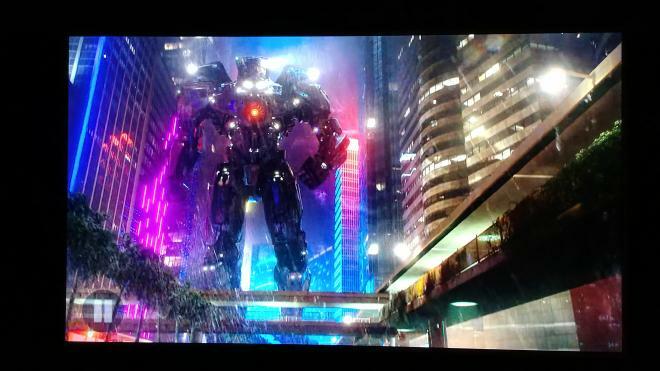 It's also the only screen material that works with PASSIVE 3D projection systems. However, Silver Ticket cautions that calibration will likely be required to dial in brightness and contrast. WAB (1.1 gain). Silver Ticket's Woven Acoustic with Backing (WAB) is a 1.1 gain acoustically transparent material. You'll need this material if you want to install in-wall speakers behind your screen. 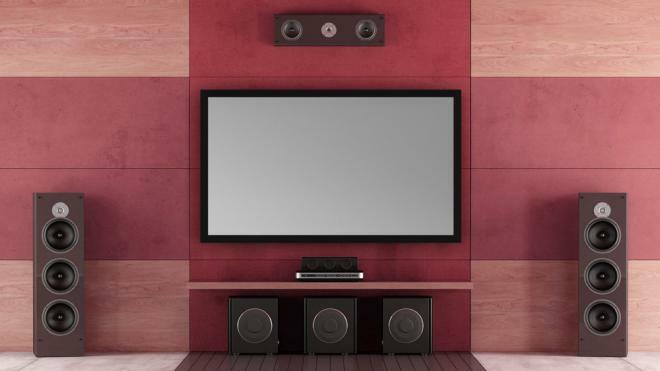 Visually, and despite 3,600 holes per square inch, the WAB material remains 4K compatible, performs much like Matte White screens, and boasts only a +/- .02dB loss in sound. Silver Ticket says this is inaudible to the human ear. Pricing and availability depend on size needs and material selections, of course, so expect to pay around $200 for the smaller, more affordable models and up to about $800 for the largest. Oh, and one helpful tip about the product names -- they're literally a breakdown of each screen's size and materials. IE, an STR-169100-HC means it's a 16:9 aspect ratio, 100", High Contrast Grey screen. An STR-1610139-S is a 16:10 aspect ratio, 139", Silver ALR screen. And so on. If you're buying on Amazon, this part's pretty simple -- select screen aspect ratio and size, then choose screen material (assuming it's available). Outside of the option for full (standard) or thin bezels, most of Silver Ticket Product's fixed projection screens look the same. The frames -- made from heavy duty beveled aluminum wrapped in light-absorbing black velvet -- come in six pieces along with assembly hardware and easy-to-follow instructions. From a build quality standpoint, even though you have to do some of the building, the materials are strong and light, the black velvet works as described, and you can't really see seams unless you're looking for them. In terms of design, the elements are simple and classic -- it's amazing how much like a CINEMA any room becomes once your screen is assembled and wall-mounted. Darker walls and room coloring will perfect the look. Also worth noting: the packaging is extremely well-organized and labeled to make setup a breeze. Speaking of which, here's the part I'm sure most folks are nervous about. Can I really build my own screen and mount it on the wall? Of course! Silver Ticket Products makes (almost) the whole process a joy, although, I'll admit, there are two hard parts. Silver Ticket recommends watching installation videos before embarking on your install, which you can do by checking out their YouTube Channel, or by following the links on their Support Videos & Media page. There are also a few dozen helpful reviews and How To YouTube videos produced by third parties. Assembly requires putting together the six frame pieces while adding in the screen support clips and wall mount brackets along the way. Once the frame is whole, you roll the screen onto the back of the frame and attach each support clip, a process that begins easy and becomes more challenging as you get to the last four or so. IMPORTANT: keep an eye out for developing wrinkles -- you may need to move some clips around to ensure a flat surface. If you leave wrinkles, you'll get on-screen shadows. Lastly, you have to measure for your wall mount locations, drill those into place, and hang the screen on the wall using the supplied brackets. This is the second-hardest part, but only a challenge if you're bad at finding wall studs and/or drilling level holes. The assembled screen is actually light enough to lift on your own, but to prevent accidental and unwanted damage -- to the screen or your ceiling -- the friend once again comes in handy. At the end of the day, I don't think a semi-DIY screen could be any easier to build and mount -- you'll actually feel like a pro installer when you're done -- and I only caution against the harder bits so you can plan ahead and avoid frustration. The keys are to read all the instructions and watch the videos, make sure you have all the hardware before you start, take your time, and get a friend to help. Easy and affordable are wonderful qualities, but worthless if the results are subpar. I learned that the hard way with my first screen, a portable model with a matte white 1.1 gain that was 1) NOT a Silver Ticket screen, 2) riddled with wrinkles and imperfections and 3) far too gainy for watching with any ambient light. Since the Epson 6040UB boasts a million to one dynamic contrast ratio, full DCI P3 color gamut reproduction, and HDR10 capabilities, I wanted to really make sure the black levels could shine, which is why I moved to the High Contrast Grey material to ensure maximum performance. In Matte White (again, not a Silver Ticket screen) in a non-light-controlled environment, the Epson suffers from poor contrast (even in HDR modes), some washout, and bland colors at times. But add Silver Ticket's HC Grey to the mix and the Epson comes to life, especially during HDR or 3D movies, with black levels diving down into inky depths that are almost as good as an LCD display. If you need outstanding 4K HDR or 3D demo material, don't look much further than Pacific Rim, The Great Gatsby, and Mad Mad: Fury Road. In either format, Gatsby and Fury Road pop with an explosion of vibrant colors, while Pac Rim is drenched in nighttime neon cityscapes. In each case, the Silver Ticket screen vanishes before my eyes and, coupled with the Epson's brightness, opened up windows into those cinematic worlds. Especially with 3D engaged, I can't believe that a visibly GREY screen could then become invisible (here's to the days where they called it The Silver Screen). BTW, I also hear Planet Earth II is amazing, but I don't own that one myself. In addition to 4K and 3D Blu-rays, regular 1080p/SDR Blu-rays and HD cable sources look fantastic, whether you're watching in color or black & white. I screened The Big Sleep and Sunset Boulevard before spending weeks with Legion and The Americans. Watching television on a glorious 100" screen is incredible -- seriously, the effect was is transportive, sitting down and firing up the projector will become the highlight of many a long, tiring work day. To be clear, for maximum performance, even with the High Contrast Grey Silver Ticket screen material, you'll want to turn out all the lights and block the windows -- especially lighting that comes from the same direction as the projector/audience position. Even then, something like a ceiling will throw light on your screen and reduce contrast. Still, with this Epson-Silver-Ticket combo, you can watch and stream TV and movies during the day without any hot spots or weird distortions. Yes, color and contrast are sacrificed some. And, sure, if all the lights are on and windows open, I'd avoid horror movies and film noirs and the like, because, so long, shadow details. But for football games or catching up on the news or binging a comedy on Netflix, the results are much cleaner, clearer, and more accurate than higher gain screen materials. And, let's be honest, you haven't LIVED until you watch Daniel Tiger's Neighborhood with your Toddler at 7AM on a 100" screen. At the end of the day, while the Epson projector offers a tremendous value for its HDR and 3D capabilities, it still can't compete with an LCD in a light-filled room (even OLEDs have trouble). Add a 100" High Contrast Grey Silver Ticket projector screen to the mix and the results vastly improve. Take this screen into darker environments, or with a projector that boasts better black levels and contrast, and forget about it. At less-than-$400, this screen does everything it claims and more. 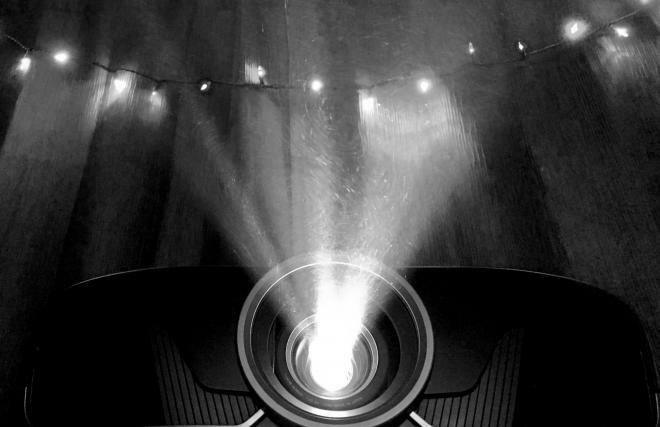 Silver Ticket Products fixed projection screens are an incredible bargain for anyone interested in setting up an immersive home theater. Sincerely, I can't recommend them enough and, if I upgrade to a full-time projection setup in the future, I'm calling Silver Ticket first. From the flexibility in sizes and materials, to the affordable pricing, to the excellent and prompt customer service department, the only thing I didn't like about my review period... was sending my loaner back. Returning to a 65" TV, which only a few years ago felt like the biggest thing ever, was cinematically-heartbreaking and made clear to me the importance and power of size and scope in storytelling. If you're in the market for a new screen, your first stop should be Silver Ticket Products.